I CAN BE MANY THINGS: are you wishing for the right thing? are you wishing for the right thing? Positive thinking is a deliberate action. You can do it too. I'M WISHING I had more time to put into my blog, so that my pictures would look professional and easy, so that I could reach my full potential and try some of the many ideas I have been so willing to share. I'M THANKFUL for my daughter, who soaks up my time like a sponge, and our play times, where we realize how much we love each other and how different our lives would be if we didn't have each other. I'm thankful that I have her as often as I do. If I had her less, you can guarantee that I'd be more upset about loosing her than being happy over the time I would be putting into being a narcissist. The truth is, I'm lucky to have a daughter to spend my days with. I have a beautiful life that is waiting to be enjoyed. How could I possibly waste it by sifting through negative thoughts? The more you add to your plate, the less room you have on it. Rocket science, I know, but once that is applied to your life... Sit and think. Prioritize. The minute my little girl tugs on my pants and says "Mommy! Up?" I may finish what I'm doing, but I never turn her down. I refuse to be the person that says "Wait" or "Maybe tomorrow" or "Not right now". Those words lead you straight to one thing: MISSING OUT ON WHAT IS IMPORTANT. These things don't last forever. I won't always have her as often as I do. I'll loose her to other things: spending time with her huge family, her friends, her school work, her life. Mommies don't often stay the center of attention, you know. ENJOY IT. I laugh at the people who scold me for still (sometimes) sleeping with my daughter (she's 18 months old) because ONE, who do you think you are to scold me and TWO, they obviously don't have what I have! I love the cuddles. I love listening to her sing along when I'm singing her to sleep. I love when she falls into fits of laughter when she's supposed to be sleeping. I love when she dozes off lying on my chest. Most of all, I love the way she will slide into the nook of my shoulder, hugging me tight with one leg sprawled over me (then I usually have to get out of there before she turns into her usual sleeping self: the bed ninja, girl of many kicks and punches). No one can tell me this is wrong; WE HAVE A BOND. I slept with my mother for 9 (okay, maybe... 7) months when I was pregnant because I felt loved and secure and that everything was going to be okay. So back to wanting to be a fashion blogger/musical mommy diva. Blogging? I'm sure it will always be around. I stress thinking I need to have my posts up daily, but truth is... if you're getting sick of waiting on me because I'm spending time with my daughter or the other love of my life, my wonderful man, well, there are a thousand other bloggers who would love to have your attention. 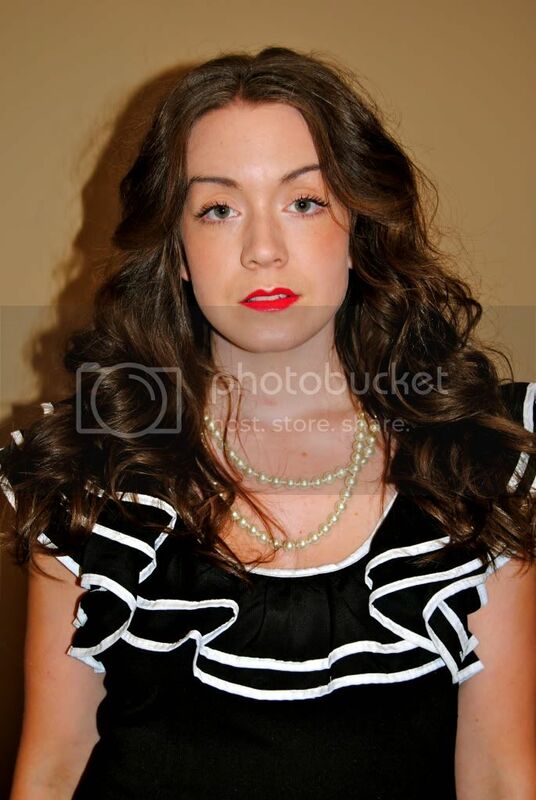 PHOTO: PREVIEW OF A PHOTOSHOOT ALYSSA TOOK FOR HER HAIR STYLING PORTFOLIO. Frustrated with my makeshift lighting. Maybe for Christmas someone who loves me could gift me some lights. HOWEVER... that stuff isn't important. Forces me to be creative!